The Batavia Road entrance to the laboratory will be closed tomorrow, July 30, at 6 a.m. to accommodate repairs to the Canadian National Railroad track crossing. It will reopen on Friday, Aug. 2, at 6:30 a.m. Vehicles entering or exiting the site should use the Pine Street entrance during this time. If weather conditions delay construction work, the entrance closure may be extended through Friday, Aug. 2. In this case, the entrance will reopen on Saturday, Aug. 3, at 6:30 a.m.
Twice a year, Todd Johnson drives 400 miles from the Fermilab campus in Illinois to a commercial polymer crosslinking facility in Ohio, which is generally used to prepare plastic tubing for uses like heating systems in houses. 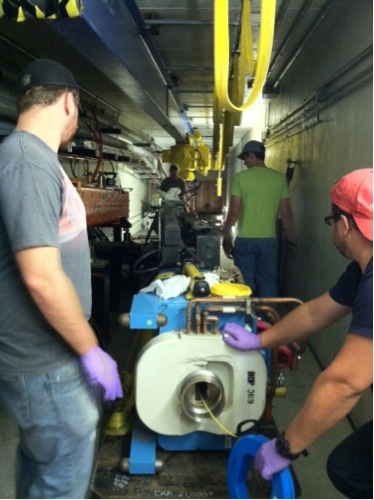 Johnson is there for its linear accelerator, something with which he is quite familiar, given his day job working in Fermilab's Accelerator Division. "The end purpose is to do it as art," Johnson says. "But we also do a lot of experiments to push it further. It's a technical challenge involving physics and a little mad science, if you'll pardon the expression. And you have art when you're done." Every six months, Johnson arrives at the facility with stencils laser-cut from steel or handmade from sheet lead; clear acrylic hunks of varying sizes; and a lot of ideas. He sends his pieces of acrylic through the accelerator's electron beam, which is designed to break chemical bonds in plastics. Because acrylic is an insulating material, the beam scatters through the material, losing momentum as it goes. Only areas of the acrylic not covered by a stencil are exposed to the beam, allowing Johnson to create shapes. Eventually the beam coalesces into a pool of electrons that desperately want to escape but can't—an invisible puddle of potential energy. Releasing that energy is a simple but arresting process. To do it, Johnson uses a hand-made tool reminiscent of a crude, oversized syringe. It works like a click pen—press on one end and the tip comes out the other with enough force to puncture the acrylic. The instant the tool punctures the surface, there's a burst of white light as the pool of excited electrons escapes from the material, leaving trails of vaporized acrylic in its place. Main Injector experts and vacuum and mechanical technicians continued to work on the MI vacuum system, recovering the MI10 vacuum and repairing three bad pumps in MI30. Technicians at NuMI replaced a bad magnet. Electrical, instrumentation, water, alignment, rigging and vacuum personnel completed this difficult task safely and in record time. 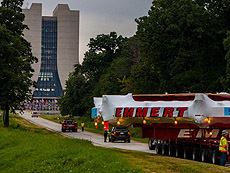 Physicists breathed a sigh of relief early this morning as a 15-meter-wide superconducting magnet rolled through the gates of Fermi National Accelerator Laboratory (Fermilab) in Batavia, Illinois. 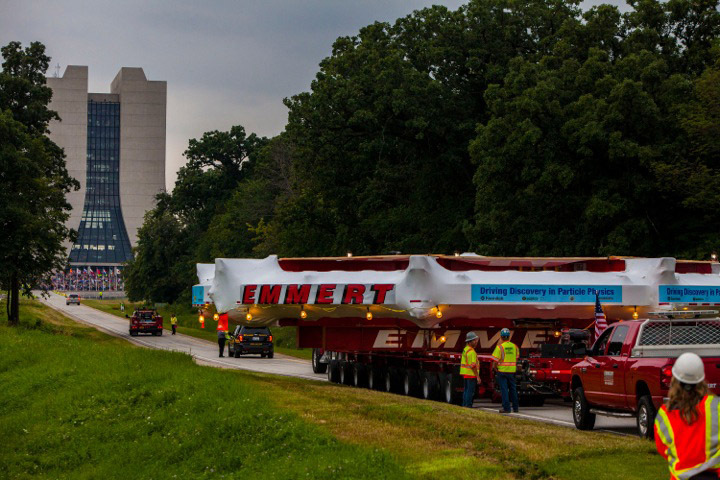 It was the last step of a nail-biting 5000-kilometer journey that moved the delicate ring-shaped magnet from Brookhaven National Laboratory in Upton, New York, to its new home on the prairie. The ring is part of an experiment called Muon g-2, which hopes to precisely measure the magnetic moment of an elementary particle called the muon in hopes of detecting long-sought-after hints of new physics. An earlier experiment at Brookhaven produced a result that didn't agree with the standard model; now, the Fermilab team hopes to conclusively confirm or refute that result by repeating the experiment with an improved muon beam. Stay hydrated to beat the heat and humidity. With heavy exertion, an individual may lose up to 3 pounds of fluid per hour. During exercise, fluid replacement is required at the rate of 150-200 milliliters of fluid every 10 to 15 minutes. For most activities plain water suffices. 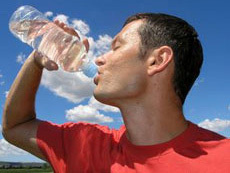 For those whose exercise interrupts meals, sports drinks supply calories while hydrating. Sports drinks containing 4 to 8 percent glucose sugar are most readily absorbed. Higher glucose concentrations tend to reduce stomach emptying time, possibly leading to cramping. Excessive fructose sugar levels can produce diarrhea. What you do prior to exertion in the heat also has a big impact on your heat tolerance. Alcohol can increase urine output, dehydrating you. It also can influence blood flow to the skin's surface, alter the body's temperature set point, and potentially augment heat stress further by diminished salt and water retention. Try avoiding alcohol for 24 hours prior to competition or exercise. If you do decide to imbibe alcohol post-exercise, rehydrate first and take the alcohol with a meal. We're stuck with what weather we're dealt. How we weather the weather is largely left up to us. Minerba Bentancourt, PPD; James Hohbein, BSS; Chad Klopfenstein, CCD; Steven Nahn, PPD; Sriram Sankaranarayanan, CCD; Lita Scott, CS; Saba Sehrish, SCD; Don Watson, CCD. GLEN ELLYN, Ill. — It skipped tolls. It had a Twitter hashtag and a GPS tracker. It even posed for photos with groupies. The 50-foot-wide, 15-ton electromagnet attracted a sensation wherever it went during its slow, delicate 3,200-mile journey from New York to suburban Chicago. The land-and-sea trip culminated when scientists threw a rock star's welcome for the mysterious, shrink-wrapped cargo on Friday as arrived at the Fermi National Accelerator Laboratory to help study blazing-fast particles.